THE second dingo identified in the brutal mauling of a French tourist and her young son on Fraser Island last week has been destroyed. The confirmation of the euthanasia comes after another dingo was destroyed on Friday evening. The woman in her 20s and her nine-year-old son suffered lacerations and bites after being set upon for about half-an-hour while on their way back to their Lake Wabby camp site from the beach. A Department of Environment and Science spokesman said Queensland Parks and Wildlife rangers on K'gari (Fraser Island) captured the second dingo identified in the attack near Eurong Beach on Thursday evening. "Considering the seriousness of the incident, this dingo has been euthanised, in consultation with the Butchulla People," he said. 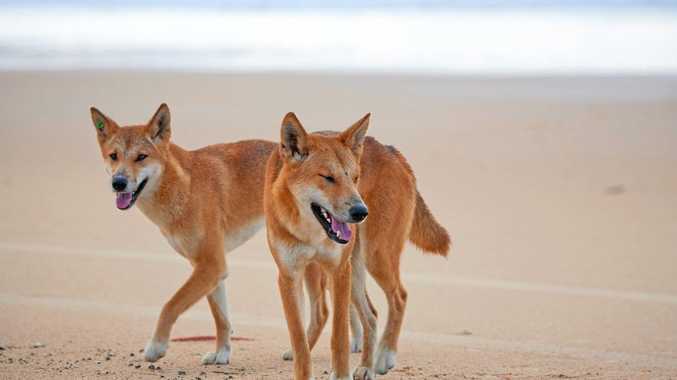 "Rangers continue to patrol at camp grounds and island arrival points to warn visitors of the dangers associated with dingoes. "Visitors are reminded never to approach or feed dingoes, as this can lead them to becoming habituated. "People are encouraged to remain vigilant and report any negative dingo encounters to a QPWS ranger or phone 07 4127 9150 or email dingo.ranger@des.qld.gov.au as soon as possible."